A good chunk of my desk ridden career has been spent sitting. I needed to make a change to that habit due to lower back issues. I think many people can relate to that. The change I decided to make? Stand in front of my desk instead of sit. Or at least get a better balance of standing versus sitting each day. 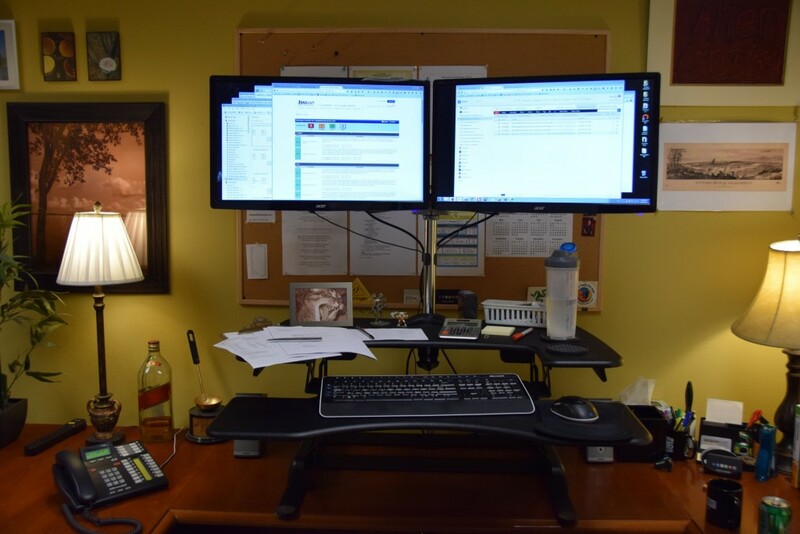 To make this happen, I decided to get a convertible standing desk, one that could raise up or down on the fly. 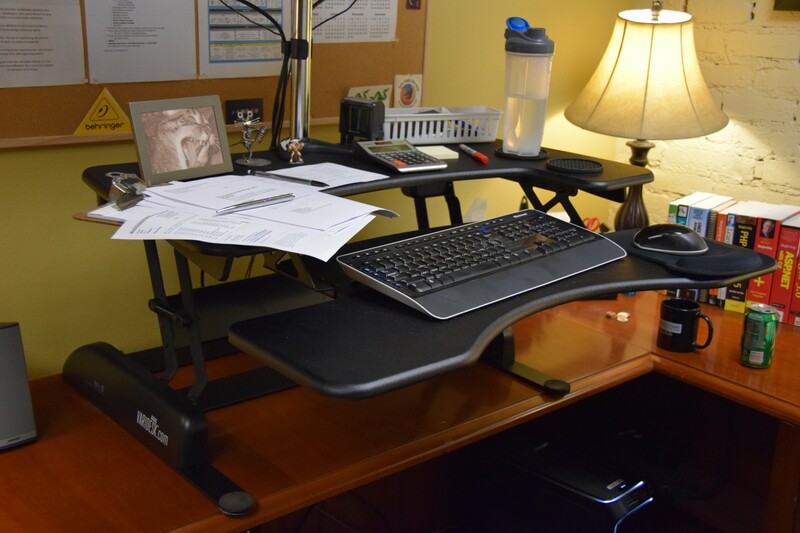 In this case, the VARIDESK Pro Plus 36 is the standing desk I purchased. The VARIDESK is a nice standing desk. I like it quite a bit. I had some issues with implementation however. 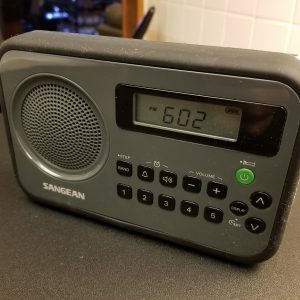 I will get into the details in this review. My opinion of the build quality of the VARIDESK is that it is very high quality. The desk surface is solid and feels good as a desk top. 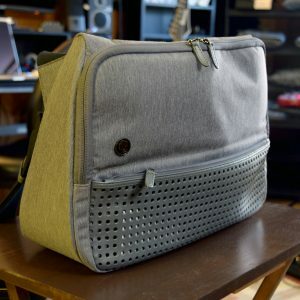 The metal hardware is heavy duty. The spring tension is great. 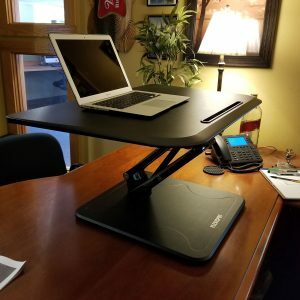 It is very easy to raise up or down.The VARIDESK is sturdy, but it can wobble a little bit if you put a lot of pressure on it. It says it supports 35 pounds of weight on the top but I can lean on mine. When I type hard my monitors lightly wobble on their mounts. I’ve gotten used to it. The VARIDESK raises up or down easily, even with monitors and stuff mounted on top of it. It doesn’t squeak or feel cheap, and is a pleasure to use. It also looks sharp with the all black coloring. Set up of the VARIDESK is easy. It comes assembled. Just cut open the box, take it out of the box and set it on top of your desk. It is pretty heavy so it’s probably best to have somebody help you lift it if you are worried about straining your back. In my case I lifted it by myself, I’m used to lifting heavy stuff.Once I had the VARIDESK on top of my desk, I set my monitors, keyboard and mouse on top of it and plugged everything back in. That was pretty much it. I think I had it all set up in less than 20 minutes. The initial setup was pretty quick. Many people will be able to get by this easily. In my case, I’m a bit a taller. I’m not super tall but I’m 6′ 3″, which is tall enough. So when I initially set everything up, and raised the desk up for the first time, the monitors were about a foot lower than they needed to be for proper standing desk ergonomics. Nuts. The keyboard and mouse are probably about 5-6 inches lower than they should be too, but the monitor height was the biggest issue. At first, the quick solution was to just stack some books and mini plastic crates to raise the monitors up higher, but it was not a very elegant solution and I was worried about monitors tipping and falling from that height. Then I decided to get proper dual monitor mounting brackets. After looking at probably too many options, I was able to find a nice mounting bracket for a decent price that would hold two monitors and get them about a foot higher off the top of the VARIDESK than they currently were. After installing the mounting bracket and monitors, I had no problem getting the monitors up to my eye level. Great! The negative result, however, was that I was no longer able to lower my desk easily to sitting position. The mounting brackets protrude from the back and bottom of the standing desk enough that it can’t be lowered all the way. And I also have to adjust the height of both monitors independently of the standing desk height. The result for me, after dealing with the issues of getting the monitors at a proper ergonomic height, is that I’ve lost the ability to lower my desk to an ergonomic sitting position. That is not what I was exactly going for here when I decided to spend good money on an adjustable height desk. The result is that I spent close to $700 on hardware to create a variable height standing desk only to find out that the design of all the products is such that I can’t make it work well as a 6′ 3″ tall dude. If only I was 5′ 6″, this would be perfect. I look at the promo photos for the VARIDESK again, in retrospect, and I’m now thinking “damn those dudes in the photos are short”. So I have a sweet convertible standing desk setup that I have to leave in standing position due to concessions I had to make due to my height. I might as well have just made a wood riser and put it on top of my desk and saved myself a few hundred bucks. I wouldn’t have found this out though without trying it out myself, so it’s hard to complain. The VARIDESK is awesome for converting between standing/sitting at your desk. However, the height issues bothered me considering how much money was spent. They should make these even a little bit more adjustable somehow so that you can adjust them for your personal height. That’s my only complaint about this desk. The quality of the unit is great, but I had to make some concessions to be able to use this due to my height. So if you are tall, or have a short desk, keep this in mind. Hi .. This is exactly what I am worried about when I receive my Varidesk. But .. I wonder if you’ve not missed something. I see you’re problem .. the monitor arm retaining bar loops under one of the support beams for the Varidesk, so when you try to go past a certain distance it interferes. I looked at the close-up, and it looks like you have 2 hex bolts at the bottom of the arm. When I look at my arm, it has a variable position for those bolts (to account for various desk thicknesses). Maybe, if you removed the arm .. adjusted the retaining bar thickness to it’s thinnest (which for the Varidesk is not that thick). You could manage to get the plate inside rather than over (if you know what I mean). Then with a little push and alter of the desk position, you could get it up and down. Just curious .. as a person potentially facing the same issue. 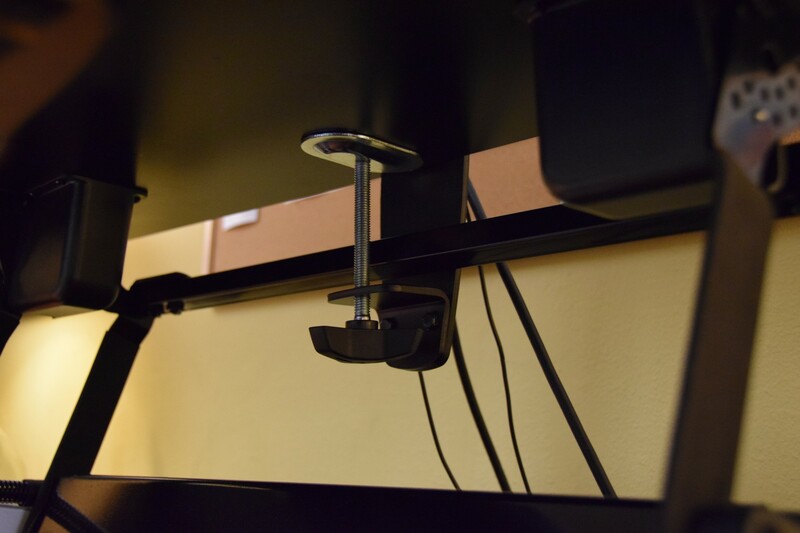 I had considered hacking the monitor mount to fit better, but in the end I just wasn’t happy enough with the total height adjustability of the Varidesk alone. Good thought though. Great review. I’m about 5’11″and the Varidesk is too short for me too. The monitors are at a good ergonomic level when sitting, but I have to use a monitor stand when fully extended. If they added another 6 inches or so to the height and an adjustable keyboard tray, it would be perfect. Thank you for sharing your experience. I had 2 workstations in my previous role and could change between them very easily (one sitting, one standing). I’m now based out of my home and while I have a sitting solution, I miss my standing workstation. I’ve been looking recently at Varidesk and others and am 6’3″ as well. Your review has confirmed that this isn’t the best solution for me. But that begs the question, what is the best standing solution? Wish I had read this review. 6’0 and the keyboard and monitor is just 2-3 inches lower than I need at full extension. Arghhh.